What is the formula for calculating annual interest expense (IntExp) which is used in the equations above? Select one of the following answers. Note that D is the value of debt which is constant through time, and ##r_D## is the cost of debt. A manufacturing company is considering a new project in the more risky services industry. The cash flows from assets (CFFA) are estimated for the new project, with interest expense excluded from the calculations. To get the levered value of the project, what should these unlevered cash flows be discounted by? Assume that the manufacturing firm has a target debt-to-assets ratio that it sticks to. (a) The manufacturing firm's before-tax WACC. (b) The manufacturing firm's after-tax WACC. (c) A services firm's before-tax WACC, assuming that the services firm has the same debt-to-assets ratio as the manufacturing firm. (d) A services firm's after-tax WACC, assuming that the services firm has the same debt-to-assets ratio as the manufacturing firm. (e) The services firm's levered cost of equity. Find Candys Corporation's Cash Flow From Assets (CFFA), also known as Free Cash Flow to the Firm (FCFF), over the year ending 30th June 2013. Why is Capital Expenditure (CapEx) subtracted in the Cash Flow From Assets (CFFA) formula? (a) CapEx is added in the Net Income (NI) equation so it needs subtracting in the CFFA equation. (b) CapEx is a financing cash flow that needs to be ignored. Therefore it should be subtracted. (c) CapEx is not a cash flow, it's a non-cash expense made up by accountants that needs to be subtracted. (d) CapEx is subtracted to account for the net cash spent on capital assets. (e) CapEx is subtracted because it's too hard to predict, therefore we exclude it. Find Trademark Corporation's Cash Flow From Assets (CFFA), also known as Free Cash Flow to the Firm (FCFF), over the year ending 30th June 2013. Find UniBar Corp's Cash Flow From Assets (CFFA), also known as Free Cash Flow to the Firm (FCFF), over the year ending 30th June 2013. Find Piano Bar's Cash Flow From Assets (CFFA), also known as Free Cash Flow to the Firm (FCFF), over the year ending 30th June 2013. Find World Bar's Cash Flow From Assets (CFFA), also known as Free Cash Flow to the Firm (FCFF), over the year ending 30th June 2013. Note: all figures above and below are given in millions of dollars ($m). A company increases the proportion of debt funding it uses to finance its assets by issuing bonds and using the cash to repurchase stock, leaving assets unchanged. (a) The company is increasing its debt-to-assets and debt-to-equity ratios. These are types of 'leverage' or 'gearing' ratios. (b) The company will pay less tax to the government due to the benefit of interest tax shields. (c) The company's net income, also known as earnings or net profit after tax, will fall. (d) The company's expected levered firm free cash flow (FFCF or CFFA) will be higher due to tax shields. (e) The company's expected levered equity free cash flow (EFCF) will not change. Which one of the following will decrease net income (NI) but increase cash flow from assets (CFFA) in this year for a tax-paying firm, all else remaining constant? (a) An increase in revenue (##Rev##). (b) An decrease in revenue (##Rev##). (c) An increase in rent expense (part of fixed costs, ##FC##). (d) An increase in interest expense (##IntExp##). (e) An increase in dividends. The firm is financed by listed common stock and vanilla annual fixed coupon bonds, which are both traded in a liquid market. The bonds' yield is equal to the coupon rate, so the bonds are issued at par. The yield curve is flat and yields are not expected to change. When bonds mature they will be rolled over by issuing the same number of new bonds with the same expected yield and coupon rate, and so on forever. Tax rates on the dividends and capital gains received by investors are equal, and capital gains tax is paid every year, even on unrealised gains regardless of when the asset is sold. There is no re-investment of the firm's cash back into the business. All of the firm's excess cash flow is paid out as dividends so real growth is zero. The firm operates in a mature industry with zero real growth. All cash flows and rates in the below equations are real (not nominal) and are expected to be stable forever. Therefore the perpetuity equation with no growth is suitable for valuation. 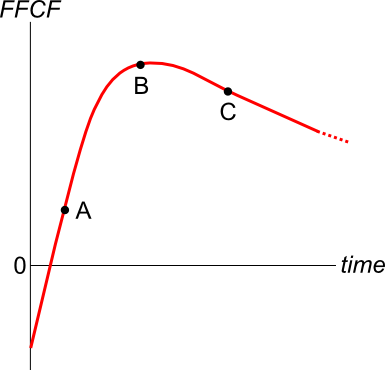 A new company's Firm Free Cash Flow (FFCF, same as CFFA) is forecast in the graph below. 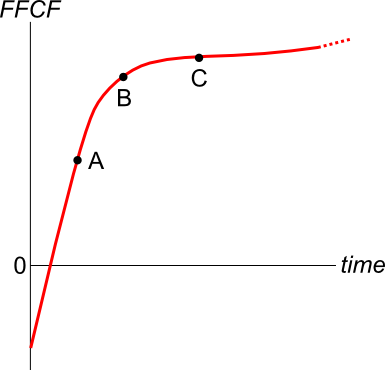 Which point corresponds to the best time to calculate the terminal value? (d) Any of the points. (e) None of the points. An old company's Firm Free Cash Flow (FFCF, same as CFFA) is forecast in the graph below. (a) An increase in revenue (Rev). (b) An increase in rent expense (part of fixed costs, FC). (c) An increase in depreciation expense (Depr). (d) An decrease in net working capital (ΔNWC). Find Sidebar Corporation's Cash Flow From Assets (CFFA), also known as Free Cash Flow to the Firm (FCFF), over the year ending 30th June 2013. Achieve firm free cash flow (FFCF or CFFA) of $1m. Complete a $1.3m share buy-back. Spend $0.8m on new buildings without buying or selling any other fixed assets. This capital expenditure is included in the CFFA figure quoted above. All amounts are received and paid at the end of the year so you can ignore the time value of money. The firm has sufficient retained profits to pay the dividend and complete the buy back. The firm plans to run a very tight ship, with no excess cash above operating requirements currently or over the next year. How much new equity financing will the company need? In other words, what is the value of new shares that will need to be issued? (e) No new shares need to be issued, the firm will be sufficiently financed. Which one of the following will have no effect on net income (NI) but decrease cash flow from assets (CFFA or FFCF) in this year for a tax-paying firm, all else remaining constant? 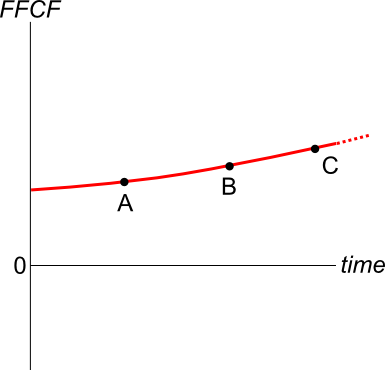 (b) An increase in rent expense (a type of recurring fixed cost, FC). (d) An increase in inventories (a current asset). (e) An decrease in interest expense (IntExp). Find Ching-A-Lings Corporation's Cash Flow From Assets (CFFA), also known as Free Cash Flow to the Firm (FCFF), over the year ending 30th June 2013. Make $5m in sales, $1.9m in net income and $2m in equity free cash flow (EFCF). The firm has sufficient retained profits to legally pay the dividend and complete the buy back. a positive cash flow of $1.1 million in one year (t=1). The project has a total required return of 10% pa due to its moderate level of undiversifiable risk. Your friend is aware of the importance of opportunity costs and the time value of money, but he is unsure of how to find the NPV of the project. He knows that the opportunity cost of investing the $1m in the project is the expected gain from investing the money in shares instead. Like the project, shares also have an expected return of 10% since they have moderate undiversifiable risk. This opportunity cost is $0.1m ##(=1m \times 10\%)## which occurs in one year (t=1). He knows that the time value of money should be accounted for, and this can be done by finding the present value of the cash flows in one year. Your friend has listed a few different ways to find the NPV which are written down below. Which of the above calculations give the correct NPV? Select the most correct answer. (e) II and V only. There are many ways to calculate a firm's free cash flow (FFCF), also called cash flow from assets (CFFA). Some include the annual interest tax shield in the cash flow and some do not. Which of the below FFCF formulas include the interest tax shield in the cash flow? The formulas for net income (NI also called earnings), EBIT and EBITDA are given below. Assume that depreciation and amortisation are both represented by 'Depr' and that 'FC' represents fixed costs such as rent. (a) 1, 3, 5, 7, 9. (b) 2, 4, 6, 8, 10. (c) 1, 4, 6, 8, 10. (d) 2, 3, 5, 7, 9. (e) 1, 3, 5, 8, 10. Does this annual FFCF or the annual interest tax shield? One formula for calculating a levered firm's free cash flow (FFCF, or CFFA) is to use earnings before interest and tax (EBIT). The project will require an immediate purchase of $50k of inventory, which will all be sold at cost when the project ends. Current liabilities are negligible so they can be ignored. The debt-to-equity ratio will be kept constant throughout the life of the project. The amount of interest expense at the end of each period has been correctly calculated to maintain this constant debt-to-equity ratio. Note that interest expense is different in each year. Thousands are represented by 'k' (kilo). All rates and cash flows are nominal. The inflation rate is 2% pa. The 50% capital gains tax discount is not available since the project is undertaken by a firm, not an individual. What is the net present value (NPV) of the project? Does this annual FFCF with zero interest expense or the annual interest tax shield? One formula for calculating a levered firm's free cash flow (FFCF, or CFFA) is to use net operating profit after tax (NOPAT). (a) Diversifiable standard deviation of asset returns. (b) Systematic standard deviation of asset returns. (c) Proportion of debt and equity used to fund the assets. (d) Cash flows from assets. Due to the project, current assets will increase by $6m now (t=0) and fall by $6m at the end (t=1). Current liabilities will not be affected. The debt-to-equity ratio will be kept constant throughout the life of the project. The amount of interest expense at the end of each period has been correctly calculated to maintain this constant debt-to-equity ratio. Millions are represented by 'm'. All rates and cash flows are real. The inflation rate is 2% pa. All rates are given as effective annual rates. The project is undertaken by a firm, not an individual. Due to the project, current assets will increase by $5m now (t=0) and fall by $5m at the end (t=1). Current liabilities will not be affected. The debt-to-assets ratio will be kept constant throughout the life of the project. The amount of interest expense at the end of each period has been correctly calculated to maintain this constant debt-to-equity ratio. All rates and cash flows are real. The inflation rate is 2% pa.
Read the following financial statements and calculate the firm's free cash flow over the 2014 financial year. Find the cash flow from assets (CFFA) of the following project. Note 1: Due to the project, the firm also anticipates finding some rare diamonds which will give before-tax revenues of $1m at the end of the year. Note 2: The land that will be mined actually has thermal springs and a family of koalas that could be sold to an eco-tourist resort for an after-tax amount of $3m right now. However, if the mine goes ahead then this natural beauty will be destroyed. Note 3: The mining equipment will have a book value of $1m at the end of the year for tax purposes. However, the equipment is expected to fetch $2.5m when it is sold. Find the project's CFFA at time zero and one. Answers are given in millions of dollars ($m), with the first cash flow at time zero, and the second at time one. Note 1: The equipment will have a book value of $4m at the end of the project for tax purposes. However, the equipment is expected to fetch $0.9 million when it is sold at t=2. Note 2: Due to the project, the firm will have to purchase $0.8m of inventory initially, which it will sell at t=1. The firm will buy another $0.8m at t=1 and sell it all again at t=2 with zero inventory left. The project will have no effect on the firm's current liabilities. Find the project's CFFA at time zero, one and two. Answers are given in millions of dollars ($m). Note 1: Due to the project, the firm will have to purchase $40m of inventory initially (at t=0). Half of this inventory will be sold at t=1 and the other half at t=2. Note 2: The equipment will have a book value of $2m at the end of the project for tax purposes. However, the equipment is expected to fetch $1m when it is sold. Assume that the full capital loss is tax-deductible and taxed at the full corporate tax rate. Note 3: The project will be fully funded by equity which investors will expect to pay dividends totaling $10m at the end of each year. To value a business's assets, the free cash flow of the firm (FCFF, also called CFFA) needs to be calculated. This requires figures from the firm's income statement and balance sheet. For what figures is the balance sheet needed? Note that the balance sheet is sometimes also called the statement of financial position. (a) Net income, depreciation and interest expense. (b) Depreciation and capital expenditure. (c) Current assets, current liabilities and cost of goods sold (COGS). (d) Current assets, current liabilities and capital expenditure. (e) Current assets, current liabilities and depreciation expense. To value a business's assets, the free cash flow of the firm (FCFF, also called CFFA) needs to be calculated. This requires figures from the firm's income statement and balance sheet. For what figures is the income statement needed? Note that the income statement is sometimes also called the profit and loss, P&L, or statement of financial performance. Use the below information to value a levered company with constant annual perpetual cash flows from assets. The next cash flow will be generated in one year from now, so a perpetuity can be used to value this firm. Both the cash flow from assets including and excluding interest tax shields are constant (but not equal to each other). What is the value of the levered firm including interest tax shields? Use the below information to value a levered company with annual perpetual cash flows from assets that grow. The next cash flow will be generated in one year from now, so a perpetuity can be used to value this firm. Note that ‘k’ means kilo or 1,000. So the $30k is $30,000. (a) The WACC before tax is 6.46% pa.
(b) The WACC after tax is 5.55% pa.
(c) The current value of the firm’s levered assets including tax shields is $603.839k. (d) The current value of debt is $600k. (e) The benefit from interest tax shields in the first year is $7.2k.